This is it! In three days, we’ll have a new U.S. President, a new Encinitas Mayor and a host of new laws and lawmakers. I don’t know about you, but the anticipation is killing me! It’s a pleasure to hit the streets and greet the people of Encinitas with fellow candidates and supporters. This was the scene at I-5 and Encinitas Blvd. last Friday afternoon. Click to enlarge and look closely for several familiar faces! While I prefer the substance of governance over the hype of elections (and we’ll get back to that next week when the elections are over), I have a special reverence for voting. Not to get too sentimental, but the physical act of voting is the foundation of my love for American democracy. As citizens, we’ve collectively decided to determine our future via the peaceful, predictable, and anonymous casting of a ballot. Voting is the antidote to violence, anarchy and totalitarianism. Each one of us plays a little part in creating the success of this representative democracy by participating, and then respecting the legitimacy of the outcome. Encinitas has 40,000 individual registered voters, each of whom gets the privilege of one vote. Don’t waste it by staying home! In 2000, as a newly minted reporter with a master’s degree in journalism from Northwestern University, my first job was at the Los Angeles Times. Several months in, I was assigned to cover our local elections. What an adrenaline rush! If you’ll remember, that was the year the Florida recount featuring “hanging chads” went on for five weeks after election day until the Supreme Court ended the recount, resulting in George Bush’s victory over Al Gore. And third-party candidate Ralph Nader added yet another dimension to that election. There’s nothing like the excitement on election night, as a reporter and now as a candidate. Which horse will cross that finish line first? 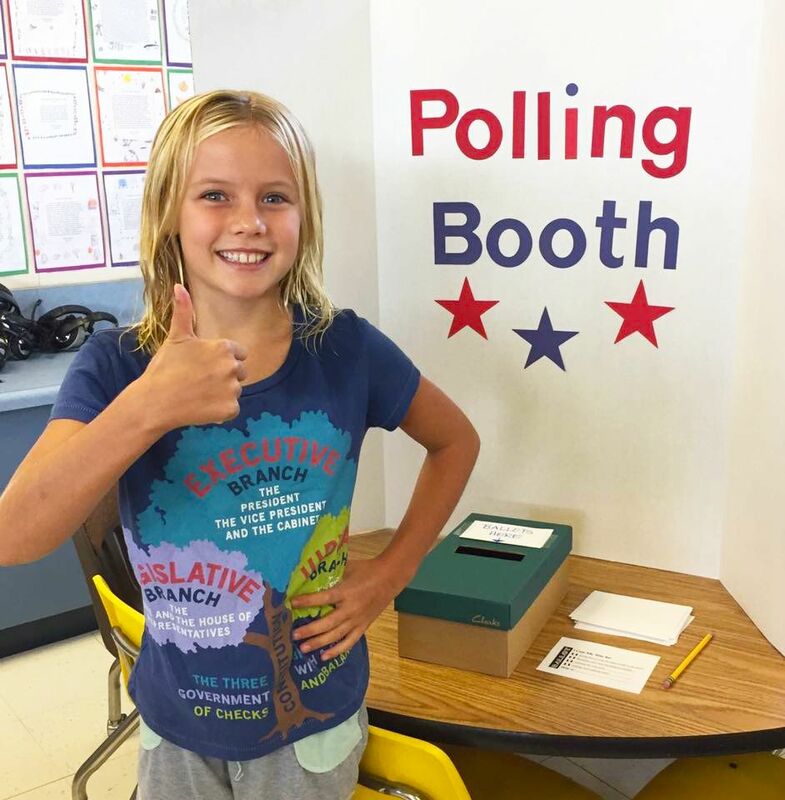 Our daughter Ava and her class recently participated in mock voting on a local issue. Sure, it’s inefficient to stand in line, laboriously fill out a long card, interact with a poll worker, and reach across the desk for an “I Voted” sticker. But this commitment to process – communally gathering with neighbors of all political persuasions who all value our peaceful transitions of power – is profound. It’s a great joy for me to share this commitment with our children, and the next generation of citizens, as well. So please vote! Don’t get too busy on Tuesday. Do it first thing in the morning to make sure it happens. If you have a mail ballot, turn it in right away. You can still help: Team Blakespear could still really use your help with sign waving, a bicycle brigade, and especially phone calling over the next three days. If you can assist, please email our Volunteer Coordinator Kris Powell at kris@blakespearformayor.com! Vote for Tony and Tasha: I strongly support two candidates in the Encinitas City Council race, and will be voting for only two. Both incumbent Tony Kranz and Planning Commissioner Tasha Boerner Horvath will work hard, reflect residents’ priorities, take a leadership role in protecting our fragile coastal ecology and our environment, move forward with important projects, and balance competing interests with fairness and open minds. Please support Tony and Tasha for the Encinitas City Council. This week’s Slime Summary: My ethically challenged opponent recently sent out a bogus mailer purporting to compare the two Mayoral candidates. Once again, it’s so full of made-up stuff that it’s hard to imagine he seriously thinks it’ll do the trick and get him elected. Deputy Mayor Lisa Shaffer deftly debunks this latest assault in her most recent newsletter. A similarly designed anti-Catherine robo-call is also making the rounds. Here’s a fairly in-depth article about the Mayoral race by Aaron Burgin in the Coast News. Finally, I couldn’t end the last newsletter of this campaign without thanking each of you for your contributions, both materially and energetically, to the movement to Preserve Our Paradise in Encinitas. Win or lose, I will always be truly grateful for your support!